Patrick Bernard Wolfe, known as P. B. Wolfe, was born on October 7, 1848, in Cook County, Illinois. His parents were John Richard Wolfe, an Irish Catholic farmer, and Honora Buckley Wolfe. He had seven siblings who survived to maturity: James Buckley (b. 1843), Johanna (b. 1849), John Buckley (b. 1851), Maurice Buckley (b. 1855), Margaret I. (b. 1857), Catherine “Kate” (b. 1860), and Richard B. (b. 1862). Two sisters, Margaret and Catherine, died in infancy. In 1847, Wolfe’s parents and brother James immigrated to the United States from Listowel, County Kerry, Ireland, along with John R. Wolfe’s first cousin Maurice Wolfe and his family. (John and Maurice Wolfe shared a grandfather, James M. “The Barrister” Wolfe.) The families arrived in New York on August 23, 1847, and from there made their way to Chicago, where Patrick Wolfe was born. The Wolfes then traveled on to LaSalle County, Illinois, where a number of John R. Wolfe’s brothers and cousins settled. John R. Wolfe and his cousin Maurice both moved on to Clinton County, Iowa, arriving sometime around 1855. Wolfe attended public schools in Liberty Township, Clinton County, and studied one year at the Christian Brothers Academy in LaSalle, Illinois. In 1870, he earned a bachelor of law from the State University of Iowa in Iowa City. In January 1871, he opened a law practice in DeWitt, Clinton County, and six years later partnered with W. A. Cotton, founding the firm Cotton & Wolfe. He remained with the DeWitt firm until 1888. On May 1, 1878, Wolfe married Margaret G. Connole, the daughter of Irish immigrants, in DeWitt. They had three children: a child who was born in 1869 and died the same year; John Loyola (b. 1879); and Mary Zeta “Molly” (b. 1881). Wolfe was active in public affairs. According to his obituary, he was “for three or four years city solicitor,” presumably of DeWitt. He sat on the DeWitt school board for fifteen years and was a member of the public library board of Clinton. On June 5, 1890, he was elected a state delegate at the Iowa state convention of the Ancient Order of Hibernians. On August 6, 1890, the state convention of the Democratic Party, meeting in Cedar Rapids, nominated Wolfe as a candidate for a seat on the state Supreme Court. In November, he narrowly lost to the Republican candidate, J. H. Rothrock, by a vote of 191,394 to 188,248. While on the court, Wolfe upheld the provisions of the Mulct Act. Passed by the Iowa Legislature in 1894, it allowed localities to decide for themselves whether saloons could operate, while also providing for petitions and appropriate taxes. (A mulct is a fine or penalty.) In August 1895, Wolfe sentenced four saloonkeepers in Clinton to ninety days in jail each for violating the act. In December 1903, he ordered an investigation into whether blackmail was behind the prosecution of some Clinton liquor dealers. On July 27, 1910, the Democratic state convention, meeting in Ottumwa, again nominated Wolfe for the Supreme Court. On November 8, he received the fewest votes of four candidates: Horace E. Deemer, Republican, 208,830; William D. Evans, Republican, 204,561; A. Van Wagenen, Democrat, 155,628; and Wolfe, 153,698. The Emerald Isle, far-famed in song and story, has furnished a number of enterprising and high-minded citizens to the United States, and they have ever been most welcome, for we have no better class of citizens. They are, almost with no exceptions, industrious, and they are loyal to our institutions and may always be relied upon to do their full duty as citizens in whatever community they may cast their lot. Among this large class the name of James B. Wolfe, whose long, strenuous and interesting career has resulted in much good to himself, his family and to his friends and neighbors, for his example has ever been exemplary and his influence salutary. Such hyperbole probably reflects the more tenuous position of Irish and German immigrants at the turn of the century. They were only just beginning to reap the rewards of American citizenship, and such advances could be quickly reversed, as Iowa Germans discovered during World War I (1914–1918). In spite of its various shortcomings, Wolfe’s History provides an often fascinating history along with a rich sampling of the attitudes and even, indirectly, the insecurities of the day. 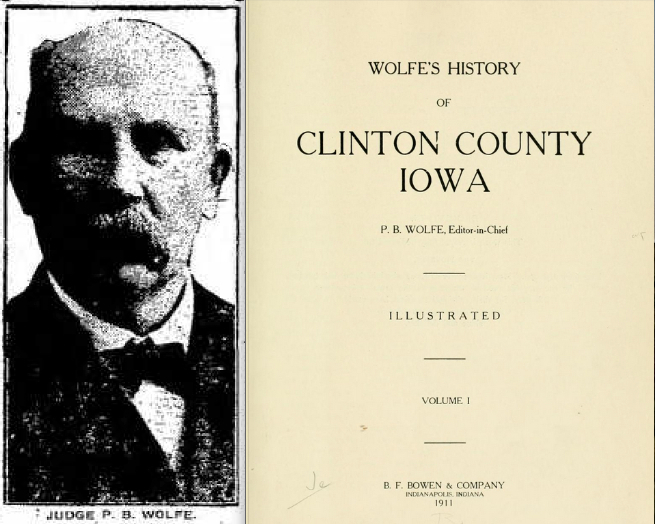 Wolfe finished his years with the firm Wolfe & Wolfe in Clinton, founded with his son, John. The younger Wolfe followed his father into the state legislature, serving in the House of Representatives from 1909 until 1911. This court ought not to be in session at all today, for today the entire state is paying tribute to Judge P. [B.] Wolfe, one of Iowa’s most earnest, loyal and sincere jurists. For thirteen years Judge Wolfe was on the bench in this district. He met the arduous duties of his life in a patriotic, earnest and sincere manner. No judge in Iowa had more respect from the public and from his fellow jurists. He realized his obligations deeply, and never failed to fulfill them.